If you have a vision of the writer, sitting in a lonely garret, waiting for the muse the strike, please think again. I am trying to keep on schedule for my new Royal Spyness book, due at the end of September. And then I get the edits from my other editor for the next Molly Murphy book, THE EDGE OF DREAMS, coming out next March. She wants them by the end of July. They are not huge but they involve moving some action around to bring it nearer the beginning of the book. So a trifle complicated. Oh, and did I mention that I have had up to 16 people in my house this week? My son got married on Saturday and we had family from all over the world staying here. Not the most conducive atmosphere to letting the muse hover around my shoulders. Also my next Lady Georgie novel QUEEN OF HEARTS comes out on August 5th, and guess what--I'm off on a book tour. Help! It's hard to write when real life intervenes. When I'm writing I am really caught up in the lives of my characters. I think through upcoming scenes in the book when I am driving, when I am throwing clothes into the washer, or when I awake in the middle of the night. If I have no quiet downtime I can't be creative. 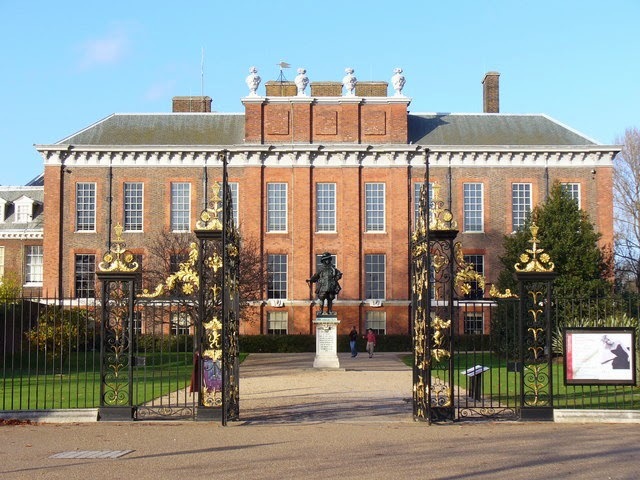 So I'm trying to be patient this week and enjoy family and not worry about getting those edits done and staying on schedule for the next Lady Georgie book, which is called, can you guess......MALICE AT THE PALACE. “How kind. Thank you,” Marina replied. We climbed out of the back seat. Marina went ahead of me. I was about to follow when I glanced back and thought I saw that strange greenish glow coming from the archway below the clock tower. I had to see for myself where the light was coming from and began to walk toward it. Then I stared harder. Surely something was lying there? Something white. My heart was beating faster and I wanted to turn and hurry into the safety of our apartment but I couldn’t help myself. I was drawn toward it. If it was the ghost of Princess Sophia I had to see it for myself. But why would a ghost be lying anywhere? Surely ghosts wafted about as they wished. As I approached the thing lying on the cobbles I saw it was indeed a dark haired young woman in a white silk dress, lying slumped over, face down. I kept moving closer, walking more slowly now. Surely the specter would vanish when I came too close? But it didn’t. I stood there, taking in every detail—the rather flashy rings on the hand that lay outstretched a few inches from my foot, the very modern short haircut with its permanent waves, and then, as I moved around to get a better view I saw her eyes, open and staring at me blankly from a deathly white face, contrasting with the bright red lips. Whoever she was she was no ghost. She had been recently alive and now she was very dead. And I'm very proud of myself. I've managed to kill somebody on page 70. Usually in my books nobody dies for at least a hundred pages! And I'm curious to now how other Jungle Reds handle multi-tasking. A family wedding is such a special time . . . congratulations! But, my goodness, what a daunting schedule. I had to chuckle when you said you'd managed to kill someone on page seventy . . . and I loved the sneak peek. I'm looking forward to reading the rest of the story . . . . I love the title Malice in the Palace. And I love Lady Georgiana. Queen of Hearts is very near the top of my TBR pile, so I am very excited about that. I have only 2 house-guests (the in-laws) this week and I can't manage to get any reading or blog writing done, so I can only imagine what a wrench house-guests must be to the true writing experience. What a full life, Rhys! Not to mention a full house. Loved reading this, Rhys. OH, so wonderful, Rhys! YOu are indeed the queen of multi-tasking and how wise of you to focus on family and really enjoy--and then go wholeheartedly into the next phase. You've got to admit--whatever you're doing, it's working very nicely! Cannot wait to see wedding photos! I need to catch a breath, Rhys! And a family wedding in the middle of all the other stuff - how nice to have a happy event in the middle of all the commitments. The WIP sounds like great fun. it goes right on my list.And you must be a very disciplined writer to accomplish so much when you do have time. I had several months recently when life just kept getting in the way, throwing one thing after another at me, most of them not at all good. ( A grandchild - the first AND nearby- was the good one!) My mantra became "Someday it will be part of what I write." You think? It sounds good. Congratulations on your son's marriage, Rhys! You win the ultimate prize for multi-tasking, I do believe. Isn't it amazing how life insists on intervening in our carefully made plans and schedules. I've had my own examples of that lately. Loved the sample from the book, and super congratulations on becoming a faster killer! Eagerly awaiting the next Georgie and Molly in this house of readers. I love that the character approaches a ghost fearlessly, and finds . . . a body!! Real fear. Quite a snap! Being where you are is the best way -- but so hard sometimes when there are many people and tasks pulling one in several directions. Finding inner peace! Rhys, I'm a big fan, and I am only at the very beginning of learning how to juggle different commitments. Love hearing about yours, and love the snippet from the next Lady Georgie book! I appreciate hearing how important quiet alone time is for your writing - sometimes I look at all that the Jungle Reds do (multiple series, books tours, this blog) and try to figure out why I'm not able to write while doing 10 other things at the same time. As always, I'm impressed, but I'm also thankful to know that you too need to hide away and immerse yourself in the lives of your characters. Congratulations on your son's wedding. Wishing you a wonderful time with your guests and lots of quiet time soon! Rhys, I had to laugh when you said you were plotting while driving and doing laundry, etc. Sometimes when I'm driving I get so wrapped up in the story in my head that I miss my exit, or suddenly realize I have no idea where I am. Very annoying. We must all multi-task because the story (and maybe the one after that) is always running in our heads. But you are our QUEEN of multi-tasking with two (or is it three?) books a year. Go, Rhys! Daughters weddings involve the mum more, Debs. The mother of the groom has to look gracious and shut up. But we did have to host a rehearsal dinner for 40 people which was a bit stressful as it was 140 miles away. I hear you on plotting or working out something everywhere - doing laundry, driving, showering. I'm exactly the same. I'll get so wrapped up on thinking about the story that I'll forget to make a turn or almost hit another car. Fortunately, I've always been able to catch myself in time. Sometimes I have to tell people, "Sorry, I can't" and focus on my writing. And sometimes the people come ahead of the writing. I give up my lunch hour every day for writing. What's that say? "Man plans, God laughs?" So true. Congratulations on the wedding! Beautiful wedding photos on your Facebook page. Is multitasking a new word of the 21st century? Perhaps women since the beginning of time have always multitasked with children to take care of, cooking, among many other things? Queen of Hearts will be here soon ~ yay! You may be "only" the mother of the groom but it sounds like you had your hands full. Forty people? Yeeks. I'm eagerly awaiting Queen of Hearts. Hopefully we'll see lots of Darcy! Not only are you the Queen of multi-tasking, Rhys, you are the Queen of logistical planning. The wedding pictures you've posted thus far on FB show a beautiful couple and setting. Kudos to you for your part in making sure your son had such a unique wedding. 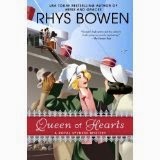 I am pages away from grabbing my copy of Queen of Hearts. I will finish up Heirs and Graces this afternoon, and then settle in to the last wonderful Georgie tale to date. I have had such a fun time reading the series. Being so in love with Molly Murphy, I feared I wouldn't love Georgie as much. Silly me. Who wouldn't adore Georgie? Also, this year, I am going to read the Constable Evans series with those delightful titles, and I will be caught up with your brilliant writing. It's going to be a great reading day today!!! Marina like the Princess Marina of Greece who married the Duke of Kent or is she another Princess Marina in your book? Had to smile at the "Men Plan, God Laughs". I had that phrase made into a sign and put in my office when I was working. Congrats on the wedding, handling all that company and the books ! I need a nap just reading about all you are doing. If anyone wants to use this, feel free. I'm working on one book and a couple appearances and I already feel overwhelmed! I'm getting so excited by the new Georgie book coming out, I can't get excited about this one - yet. Wait until mid-August, and then I'll be peppering you with questions about this one.